Percussion ensemble: What is it? You are here: Home / Arts and Entertainment / Percussion ensemble: What is it? Senior Caleb Breidenbaugh plays a marimba. 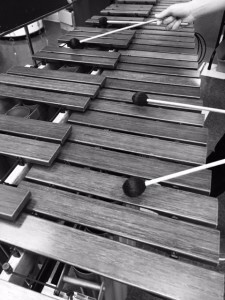 Percussion ensemble is a group that uses marimbas, vibraphones, bells, and other keyboard instruments to rehearse and perform during the school year. Directed by Luke Helker, the ensemble plays a variety of contemporary classical music. The group has 18 members total, and its participants are Penn Manor High School students. Despite how new percussion ensembles are, this is not Penn Manor’s first year at it. Helker enjoys teaching students who are eager enough to try something new and helps them learn musical “history, theory, and etiquette” to prepare them for a musical career or path they might choose in the future. While there are no openings for students to join this semester, the group will have openings available for the spring semester. The ensemble rehearses at the high school every Thursday from 6-9 p.m. during the school year. Rehearsals are held in the band room (249).